I always give my Ladies-wot-Brunch favors when we get together. It's just something I've always done. This time I reused baby food jars and filled them with a homemade peppermint sugar scrub. The scrub is fabulous for softening and deodorizing hands or feet. Whiz the candy canes up in the food processor until fairly crushed. Pour all ingredients in a big bowl and mix well. To use: put a spoonful in your hand and rub into skin. Rinse off and dry. For best results, use before bedtime and put on gloves or socks after you rinse the solids away. I keep candy canes years round Ms. Sol. My brother was just teasing me over the weekend about how he had never seen someone throw candy canes in as much stuff as I do. :) Thanks for stopping by! I just love your blog name. It is so cute. How can I contact you? Do you have an email where I can reach you? I have several ideas I would love to share with you. Thanks for finding me fellow Texan! I am going to give this a try using coconut oil. I like the idea. I made a scrub using coconut oil, sugar, and spent coffee grounds for use on my hands after cutting garlic and it is fairly wonderful. I think you'll like the coconut oil version. :) Thanks for stopping by Ms. Nicki! What a great idea! Thanks! I am thinking the Hubby will benefit from this. I like this. A lot. My Walmart still has a ton of candy canes out on clearance, so I might have to swing by and by a ton or two and make this as gifts, keeping some for myself of course. ;-) Found you from bloggymoms, when you stopped by my blog awhile back. Now a follower on Facebook, Pinterest and Networked blogs. Well thanks for stopping by Ms. Carrie! You could also do this with peppermint candies but if the canes are on clearance then I like them better since there is less unwrapping involved. :) Thanks for stopping by! Oh this looks so awesome! !I bet it smells so good too! Maybe a good gift idea for teachers for Valentine's Day too!! Thanks for sharing!! Newest Texas Blog Follower! hugs! It's awesome AND easy which I love! :) Thanks for stopping by Ms. Janette! 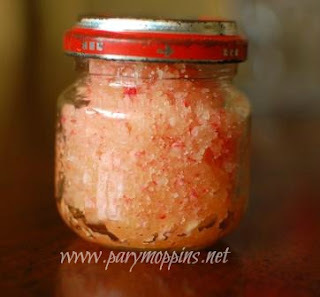 I could use some of your awesome Sugar Scrub to get rid of the winter dry skin. Hope you have a great weekend and thanks for sharing your tasty recipe with Full Plate Thursday. Absolutely Miz Helen. Thanks for stopping by! You could also do this with wrapped peppermints but it'as a bit fiddly. Definitely keep all those baby food jars. You can use them in a billion ways! This sounds lovely. I use a store-bought peppermint lotion on my feet as my heels are always dry - too much running around in bare feet after a four-year-old, so I think this could be a really nice alternative. Oh yes this is great on your feet! Thanks for stopping by!